In the pilot for the ABC series Moonlighting, recently bankrupt former model Madelyn “Maddie” Hayes (Cybill Shepherd) opts to join one of her tax write-offs, the quickly retitled Blue Moon Detective Agency, partnering up professionally with David Addison Jr. (Bruce Willis). The next 65 episodes were crafted as one-hour movies that mixed comedy with drama, airing parodies of and homages to everything from William Shakespeare to classic cinema. Today the experimental, regularly fourth wall-breaking Moonlighting is most often evoked to talk about “The Moonlighting Curse,” the term for whenever a hit show seems to lose creative steam—and viewership—after its two leads consummate their relationship. Officially, the show only ran for five abbreviated seasons because of the ascendant career of Bruce Willis, Cybill Shepherd’s pregnancy, the friction between one of its stars and the show’s creator, and the network tiring of Moonlighting’s expense and production delays. Still, some believe that Maddie and David finally getting together after years of sexual tension was the final nail in the coffin for the series. 1. THE CREATOR WAS TOLD TO MAKE A DETECTIVE SHOW, EVEN THOUGH HE DIDN’T WANT TO. After the first two pilots in a three-pilot commitment to ABC didn’t make it to series, the network president told Glenn Gordon Caron to make a detective show. Caron remembers that his "eyes rolled to the top of my head. I think I said something to the effect of, 'That's what America needs, another detective show.'" When he met with the network again, Caron insisted on adding some romance to his version of a detective series. 2. THE SHOW’S BIG INFLUENCE WAS THE TAMING OF THE SHREW. 3. CARON REALIZED HE WAS WRITING MADDIE WITH CYBILL SHEPHERD IN MIND 50 PAGES INTO THE PILOT. 4. THOUSANDS OF ACTORS WERE CONSIDERED BEFORE BRUCE WILLIS. Bruce Willis (whose lone TV credit before 1985 was as "Tony Amato" in an episode of Miami Vice) arrived to his audition with a “punk hairdo and earrings.” Shepherd remembered that Willis was wearing army fatigues, and unlike the other men who auditioned with her that day, he didn’t go out of his way to flatter her. He avoided eye contact with her and mostly talked with Caron. After he left the room, Shepherd says she told Caron that Willis was the one they needed to play David. Caron later said ABC executives “vigorously” didn’t want Willis, and were willing to pay him and Shepherd off to “go away” because they felt the David role was un-castable. 5. BILLY JOEL WROTE "BIG MAN ON MULBERRY STREET" WITH THE SHOW IN MIND. After Caron heard it, he thought up a way to work it into an episode (which would be titled after the Joel tune). Always wanting to work storytelling into dance, Caron called film director Stanley Donen (Singin' in the Rain, On the Town) to get him behind the camera for the dream sequence, where Maddie imagines David’s relationship with his ex-wife. The song officially appeared on Joel’s album The Bridge (1986). 6. ORSON WELLES' LAST APPEARANCE WAS ON MOONLIGHTING. Because ABC was concerned about confusing viewers if they aired an episode in black and white, Caron called Welles to ask him to introduce “The Dream Sequence Always Rings Twice." Finding Caron’s written intro funny, Welles agreed. The introduction was shot on October 3, 1985; Welles passed away one week later. Take one was “perfect” according to Jay Daniel, but the legendary actor/writer/director insisted on a few more takes anyway. 7. IT WAS THE MOST EXPENSIVE PRIMETIME SERIES ON TELEVISION. 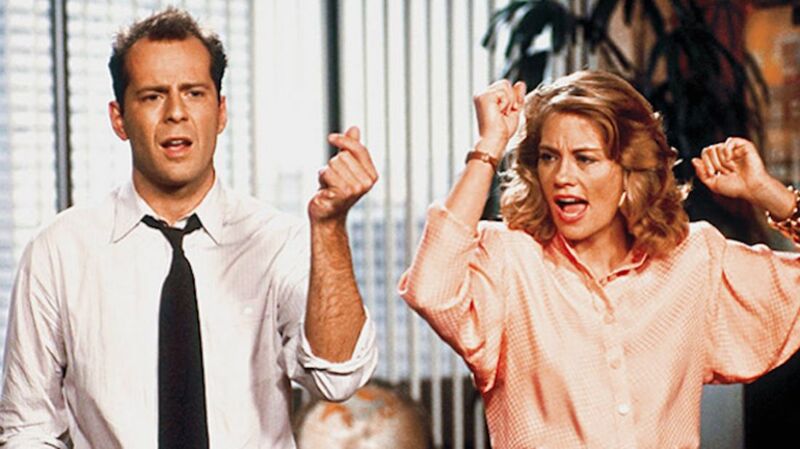 The estimated cost per Moonlighting installment was about $1.6 million. “The Dream Sequence Always Rings Twice” episode cost a reported $2 million. 8. WILLIS AND SHEPHERD ARGUED ON SET. “There was discord on the set,” Caron recalled in 2008. “The show was really difficult to do, and they were in every frame. Bruce was at the beginning of his career, as was I—we were excited and enticed by the prospect [of doing the show]. Cybill was a movie star and didn't anticipate how difficult the show would be to do. When she became pregnant, it made it even harder. A lot of discord centered around that—working 14 to 15 hours a day, and the way I worked, pages came very late," which created more tension with the show's stars. According to Daniel, sometimes Willis and Shepherd would receive 10 pages of dialogue they had never seen before one hour before they had to perform it. 9. CARON DIDN’T WANT BRUCE WILLIS TO DO DIE HARD. ”I pleaded with Bruce Willis not to do Die Hard," admitted Caron in 1999. "Sometimes [actors] don’t listen to you, and it’s a good thing.” Die Hard (1988) turned Willis into a movie star. 10. WILLIS BROKE HIS COLLARBONE WHILE SHEPHERD WAS PREGNANT, WHICH MADE FILMING DIFFICULT. In “I Am Curious ... Maddie”—the episode where Maddie and David finally get together—a lengthy underground garage scene featuring Willis, Shepherd, and Mark Harmon was shot despite the fact that, according to Daniel, "Never once were all three of those actors there together, never once. It was all doubles, trick shots, and somehow we had to go there three times to shoot one scene." 11. THE EPISODES STARRING AGNES DIPESTO GOT LOWER RATINGS. Agnes DiPesto (Allyce Beasley) started out as the detective agency’s receptionist, but eventually began taking on cases of her own in an effort to lessen Willis and Shepherd’s workloads. The cast and crew noticed that in the episodes that featured DiPesto and Herbert Viola (Curtis Armstrong), the ratings dropped in the second half hour, when people realized the episodes weren’t going to feature their beloved David and Maddie. 12. SHEPHERD WAS AGAINST MADDIE’S SUDDEN MARRIAGE. Maddie was written to impulsively marry Walter Bishop (Dennis Dugan), a man she had met on a train. “When I strongly voiced my objection that the character we had created in Maddie would never do such a thing, Glenn [Gordon Caron] said words to the effect of ‘Just shut up and do your job, you’re not producing this show,’” Shepherd wrote in her book, Cybill Disobedience. 13. THERE WAS SUPPOSED TO BE A 3D EPISODE, SPONSORED BY COCA-COLA. The soda company produced 40 million pairs of glasses, but a writers strike canceled the promotion. The company ended up handing out 20 million pairs of those glasses for the 1989 Super Bowl halftime show. 14. CARON AND WILLIS WANTED TO DO A WESTERN-THEMED EPISODE. “I think we always promised each other we'd do a Western, which we never really got around to doing,” Caron said. 15. SHEPHERD IS OPEN TO A MOONLIGHTING MOVIE. She said as much in 2013; Willis was open to a movie back in 2009, as long as Caron was involved. Caron had been fired before the show's fifth and final season—allegedly at Shepherd’s insistence.